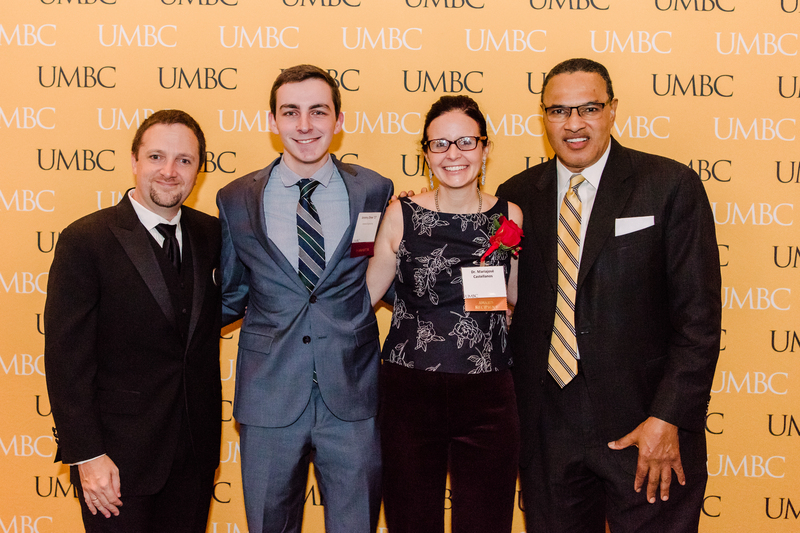 UMBC community members from the university’s first class to today kicked off Homecoming 2018 on October 4 with a celebration of UMBC Alumni Award winners. 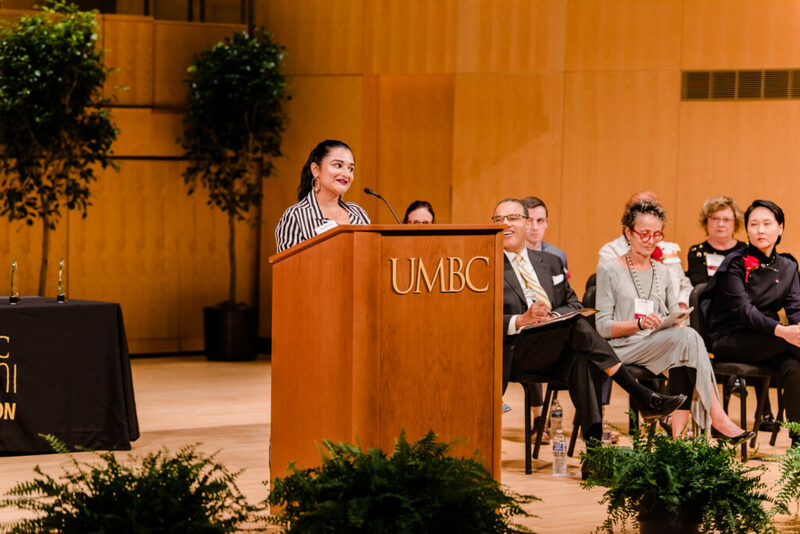 Held in the Earl and Danielle Linehan Concert Hall, the moving and memorable ceremony reflected the rich community that is UMBC and honored the tremendous achievements of eight exceptional awardees. Kimberly Ellison-Taylor ’93, information systems, received the 2018 Outstanding Alumna in Engineering and Information Technology Award. She bridges her knowledge in technology and finance as a global strategy director at Oracle. She is also the youngest person and first African-American woman to be elected as chair of the American Institute of Certified Public Accountants. 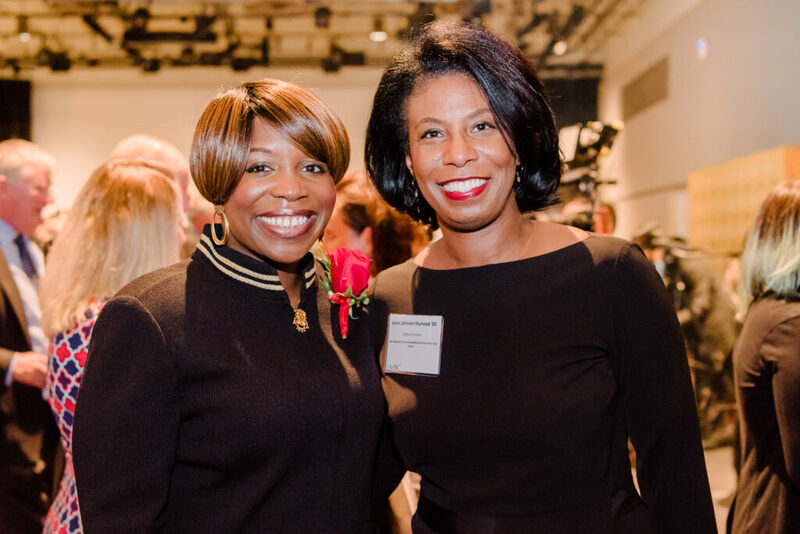 Awardee Kimberly Ellison-Taylor ’93 (left) with Karen Shaheed ’85. Allan Kittleman ’81, political science, introduced Zainab Alkebsi ’09, political science, this year’s Rising Star Award recipient. Alkebsi serves as policy counsel for the National Association for the Deaf. Awardee Zainab Alkebsi ’09 (center) with family members. 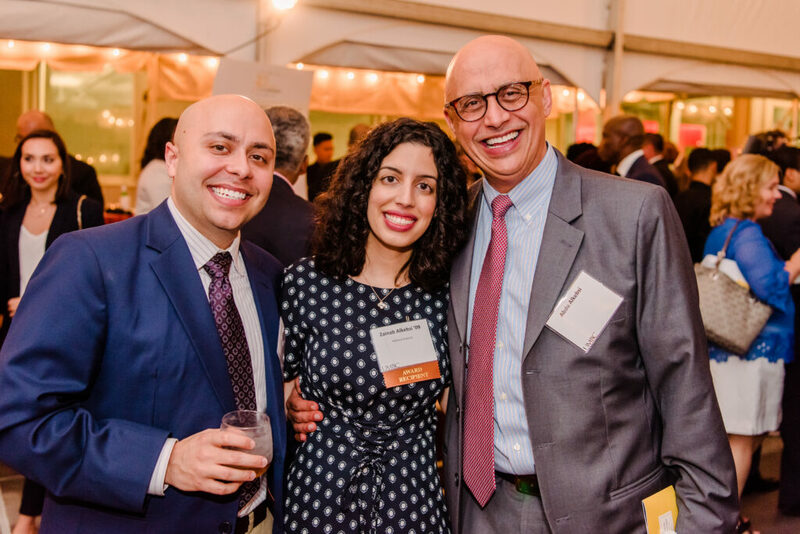 Alkebsi thanked her UMBC professors for encouraging her personal and professional growth. She shared that she continues to give back to UMBC by presenting guest lectures focused on the Deaf community. Kathleen Hoffman, mathematics, and David Mitch, economics, introduced Mark Doms ’86, mathematics and economics, the 2018 Outstanding Alumnus in Natural and Mathematical Sciences Award recipient. A leading economic policy expert, Doms served on the Board of Governors for the Federal Reserve and as the Under Secretary for Economic Affairs at the Department of Commerce under the Obama administration, and worked at Japan’s largest investment bank. In addition to a strong academic preparation, “UMBC instilled in me a sense of public service,” Doms said. His career has been primarily in the public sector, and he intends to teach at a public university when he returns to the United States from his current work in Europe. Award recipient Saira Khan ’09 addresses the audience. Khan began her career as a freelancer for Dawn, an English-language publication in her native Pakistan, “moving seamlessly between two very complicated worlds,” Corbett said. Less than a decade later, she is now director of social media for The New Yorker. Her often-controversial art includes a series of political videos framed as art history lessons, which she placed on flash drives inside balloons and launched from South Korea over the border with North Korea. The South Korean president and first lady visited her most recent exhibition. Awardee Mina Cheon, M.F.A. ’02, speaks at the Alumni Awards. Cheon’s connection to the university has been long-lasting. She graduated from UMBC with her infant son in her arms, and now he is studying math at UMBC. “Thank you for being the leading, visionary STEAM research community where I grew abundantly and where my son will be nurtured to flourish in his academic track,” she shared. Wanda Keyes Heard ’79, political science, the 2018 Outstanding Alumna in Social Sciences Award recipient, is the first female chief judge of the 8th Judicial Circuit. Keyes Heard holds this position following 19 years of service as a circuit court judge in Baltimore City. She has mentored dozens of UMBC students and fellow judges. 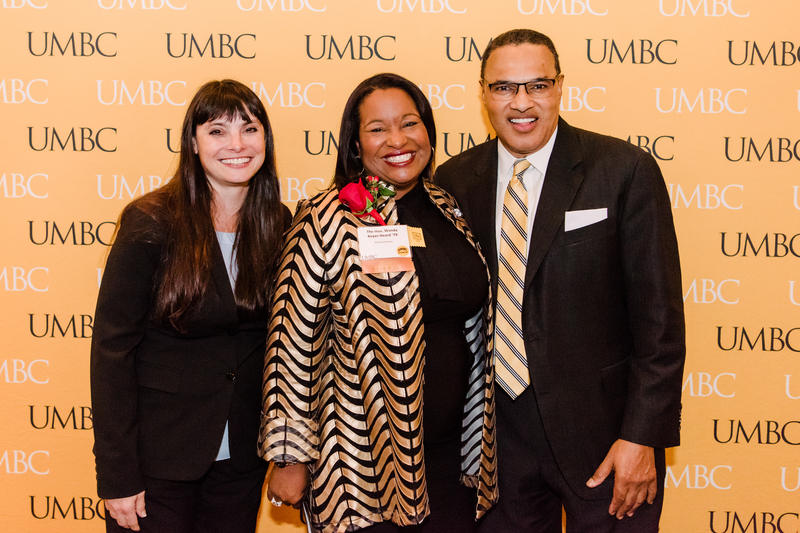 Carolyn Forestiere (left), Wanda Keyes Heard ‘79 (center), and President Freeman Hrabowski. Mimi Haw Dietrich ’70, American studies, received the 2018 Outstanding Alumna for Distinguished Service Award. As a founder of the “Fab Four” group (comprised of members of UMBC’s first four graduating classes), Dietrich remembers a time when UMBC included just three buildings. Mimi Haw Dietrich ’70 hugs her close friend and nominator, Donna Hekler ’70, English, at the Alumni Awards. 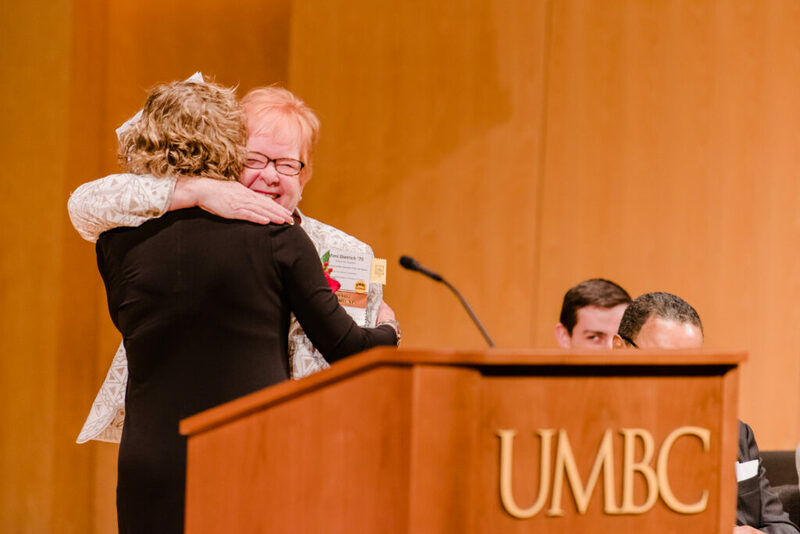 For UMBC’s 50th anniversary, Dietrich was one of the first to galvanize alumni to organize and participate in the celebrations. She continues to serve UMBC by organizing Fab Four events. 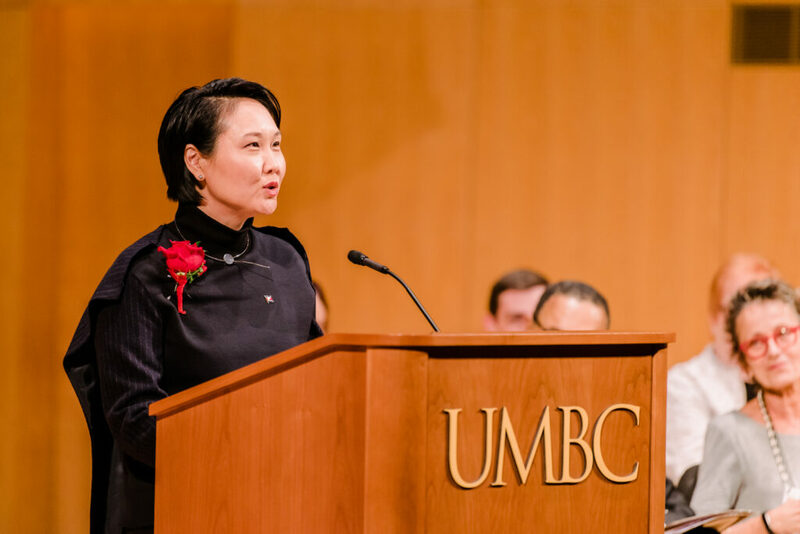 She previously served on the Alumni Association Board of Directors and was named UMBC Volunteer of the Year in 1999 along with her husband, Bob Dietrich ’70, biological sciences. Professionally, Dietrich has been dedicated to spreading her love of quilting and needlework as an educator for 50 years. She was inducted into the Quilters Hall of Fame in 2015 and named the Professional Quilter of the Year in 2013. Mariajose Castellanos, chemical, biochemical, and environmental engineering, is the 2018 Outstanding Faculty Award recipient. Castellanos, a teaching faculty member, expressed gratitude that her department supported her when she “chose to pursue teaching and leadership through service,” rather than continue in research. Left to right: John Becker ’01, Jeremy Drew ’17, Mariajose Castellanos, and President Hrabowski. Banner image: Wanda Keyes Heard ’79 speaks to a full Linehan Concert Hall. All images by Marlayna Demond ’11 for UMBC.